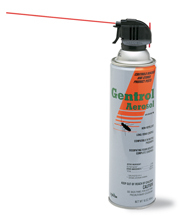 Gentrol aerosol IGR is an odorless, non-repellent Insect Growth Regulator that targets cockroaches, stored product pests, drain flies, fruit flies and bed bugs. It is ideal for sensitive areas like schools, hospitals, nursing homes, day care centers, houses and can even be used in food processing and service areas! Comes in a convenient 16oz. container. AND, Gentrol Products use hydropene making this another one of our popular green pest control products! Would you like to see the Gentrol Aerosol Label? How About The Gentrol Aerosol MSDS?